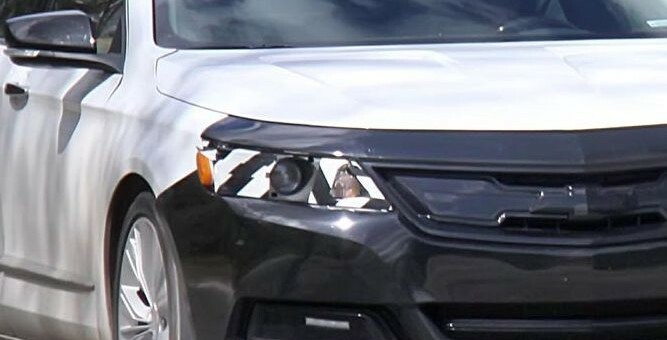 Spied: A Chevrolet Impala Hybrid? It all seemed like a boring Monday for General Motors news. When suddenly, a wild camouflaged Chevy Impala appeared! Now, depending on who you listen to, this could mean that engineers are hard at work on a range-topping high-performance model, one that could perhaps carry the SS and could rival the Ford Taurus SHO and couldgoveryveryfastandwillhaveallwheeldriveandbeverybigand ahhhh!!! Actually, if you visit the gallery of spy photos on Autoblog and even look at the brakes, they don’t seem to be any bigger or more capable than the Impala that was unveiled in New York. And that front fascia, the grille is more restricted than before, and there’s nothing to suggest that there’s something more aggressive on the way. The LED daylamps are even missing. Moreover, GM execs have insisted that all-wheel-drive is currently not in the plans for the Gen-X Impala – – a necessary feature that the new Chevy big body would need to thwart the Ford Taurus SHO, among other things. So, Chevy Impala SS? A better guess would be an Impala hybrid. Or, it’s simply nothing more than a pre-production Impala continuing its testing rounds. It’s not like development stops after the official reveal, after all. Why a hybrid isn’t there an e-assist model ? I omitted the spaces on purpose, to give the read an overly excited tone! seewhatIdidthere? I had a really hard time reading for some reason and also just in case someone is dyslexic or something they can read what it says. Definitaly not a hybrid, I can’t see GM making a competitive hybrid, So I’m going with SS model. Half of me is saying this will be SS and half of me is saying that this will be the Voltec Hybrid. twin turbo most likely, SS most likely both have and are being considered. remember the RWD car to be announced in the near future. Many suprises to come in the next 12 months being the largest number of models ever released creating one of the youngest car lines in the industry. I hope you all like the future models. Just as a little bit of news this is a model that has not been announced yet. The thing to look at in the picture is the grille. IMO it looks a lot more hybrid than performance.